My life subscribes to the principle of “living well’ and I try to translate this through every aspect of what I do. 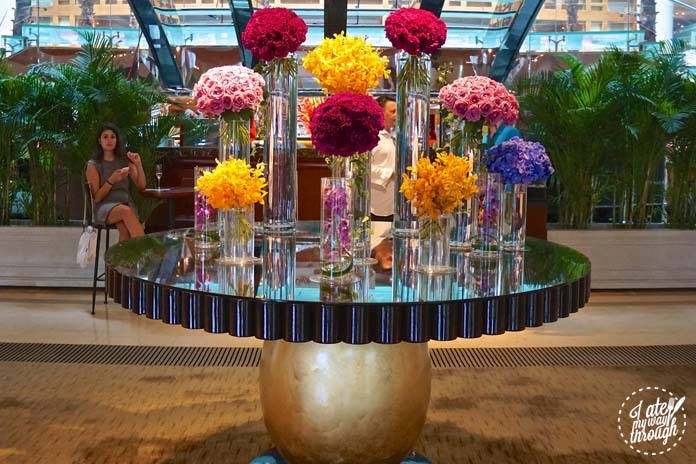 The Westin aptly condones this approach with their philosophy the Seven Pillars of Living Well dictating the hotel’s values and transmitting throughout their spectacular property in Shanghai. 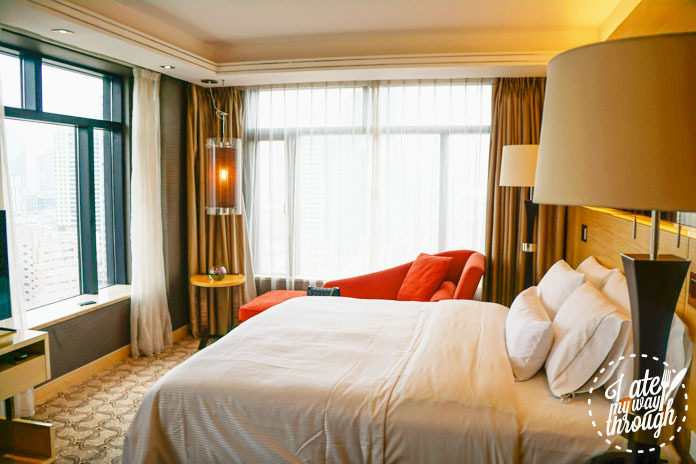 Located a stone’s throw from the Bund, this buzzing hotel is a hype of action, particularly popular for business visitors. 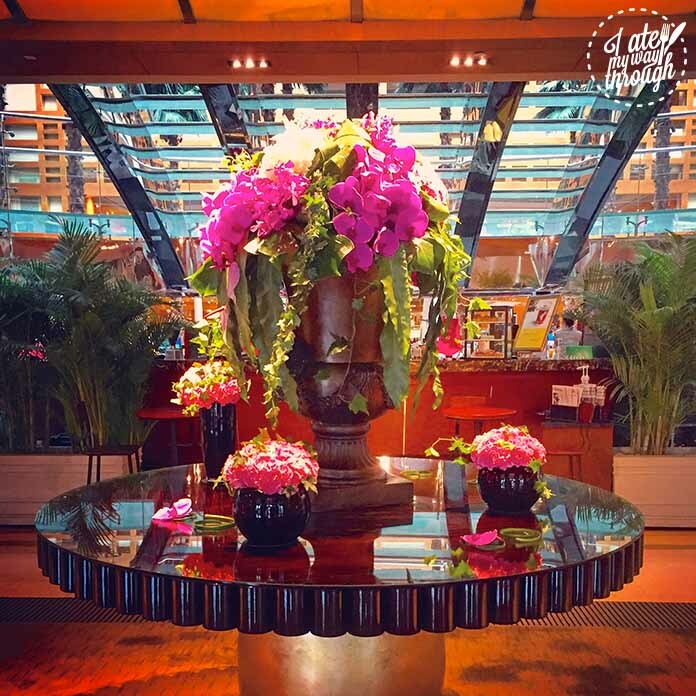 Upon arriving at the hotel, we were blown away by the amazing floral centerpiece that greeted us with its gorgeous electric pink orchids speaking wonders. After being led to our room overlooking the busy streets of Shanghai, we quickly gained our bearings spying the constant hype of activity below. Lounging on our bed, it felt luxuriously comfy – home to the hotel’s signature Heavenly Mattress, I felt like I was laying on a cloud of marshmallows. 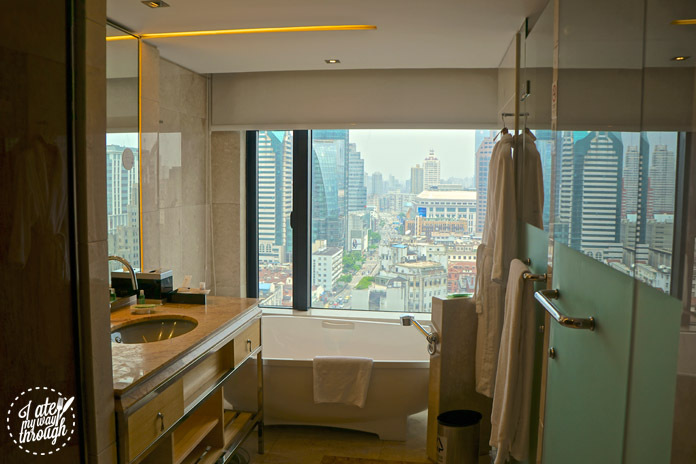 Walking into our spacious bathroom, we were greeted with a huge bath looking out over the city with jaw-dropping floor to ceiling windows gasping out over the streets below. I would definitely be taking pleasure in this and indulging in a bubble bath later! 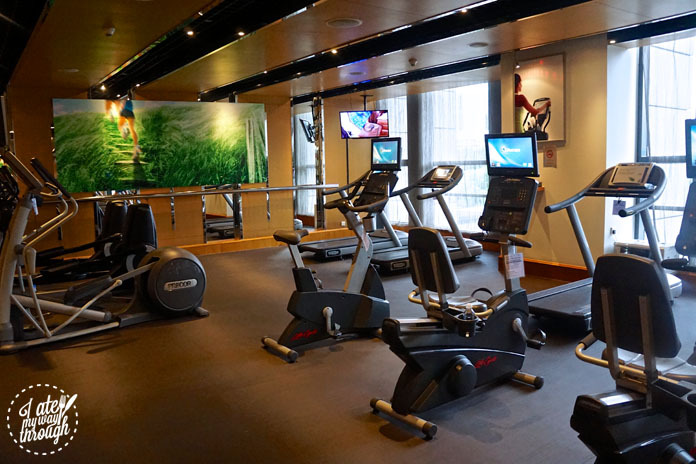 The hotel includes a range of features that are perfect for whatever type of traveler you may be. 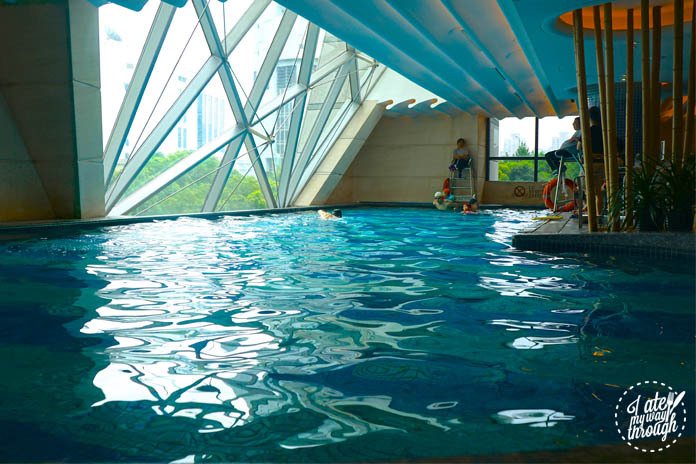 An excellently equipped gym, large pool, a range of restaurants, business center, enticing spa and an executive club, plus the convenient location to East Nanjing Rd shopping precinct and the beautiful Bund foreshore. The Chinese restaurant, Crystal Garden delivered some of the most delicious Chinese food of our six week Shanghai visit. 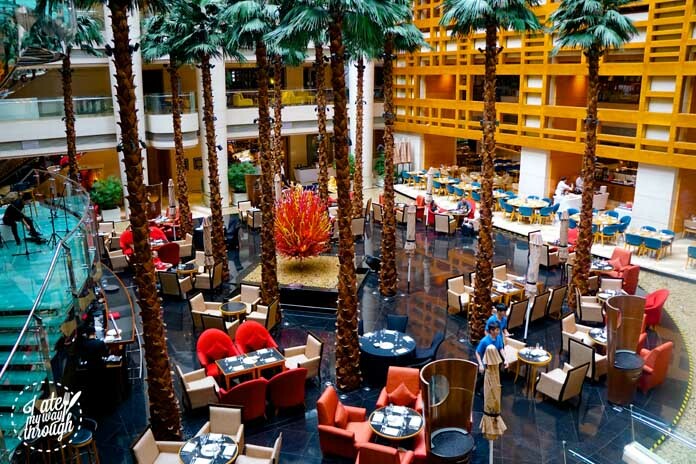 With authentic cuisine prepared by star chefs using quality produce, the flavours exploded from the dishes. 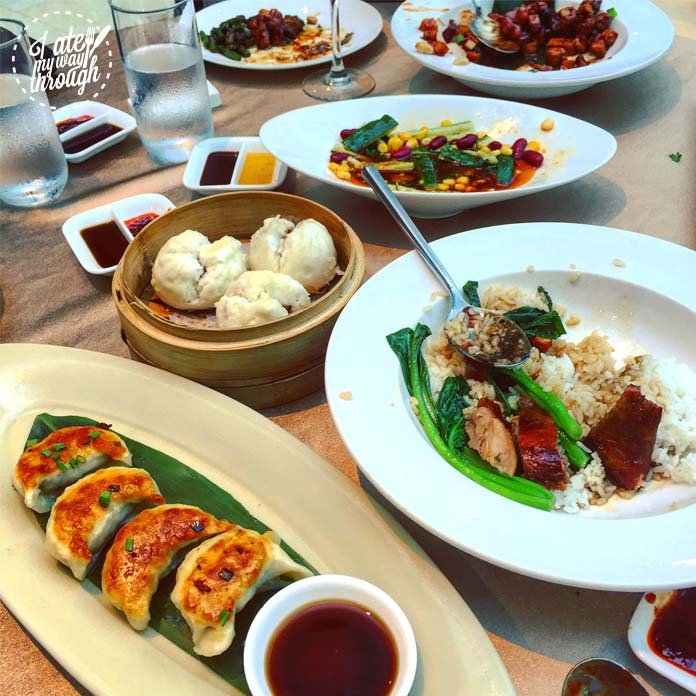 Our picks included traditional Shanghainese dishes such as cucumber in oil, pan fried dumplings and some incredible Stir-fried pork and prawn in sticky sauce – all of which had us begging for more. 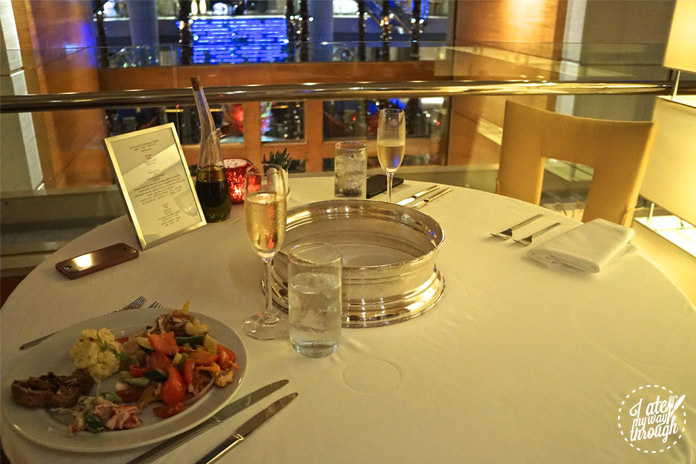 The Italian restaurant named Prego, is a great place for a delicious Friday dinner before progressing onto a fun Shanghai night out. 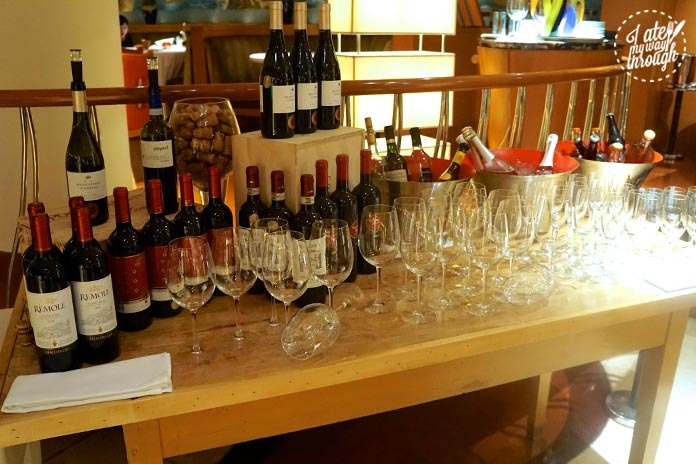 Each week, the restaurant is host to La Carnivore Champagne Friday, where they offer an amazing all you can eat meat dinner with free flow Tattinger and wine for ¥588 (AU$115) or without ¥488 (AU$95). 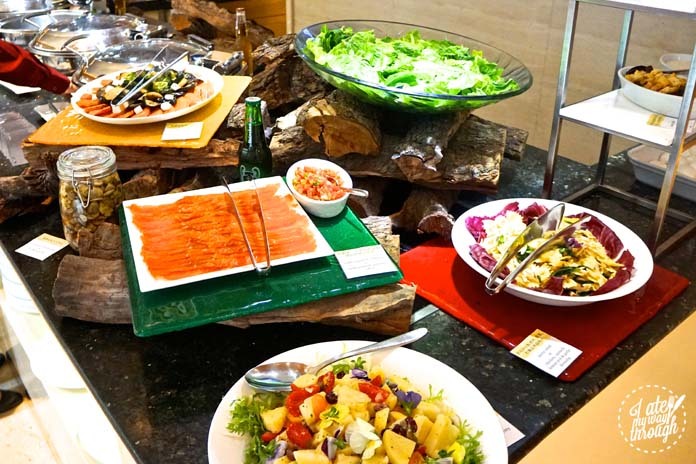 Help yourself to some freshly prepared salads before enjoying a delicious plate filled with grilled meat of all kinds! 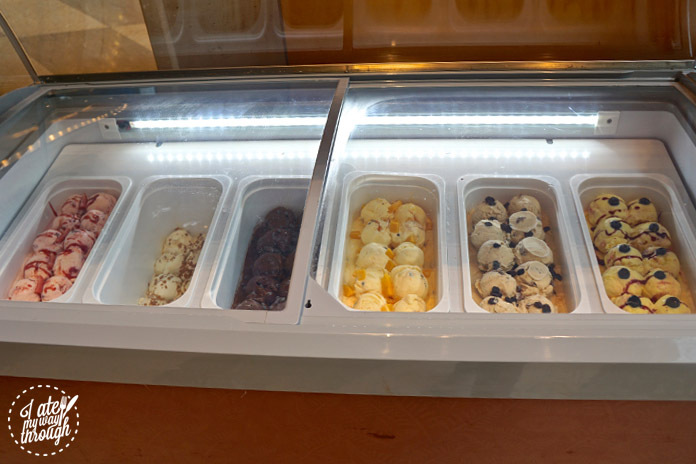 Dessert allows you an unlimited amount of ice-cream and choice of some freshly made tiramisu. The coffee pudding was light and chocolaty, delivered in a cute little translucent tin. 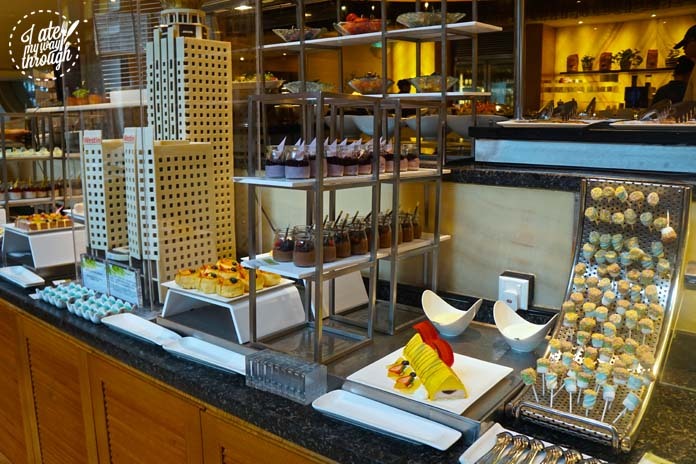 Whilst staying, we were lucky enough to sample the hotel’s renowned Sunday brunch. 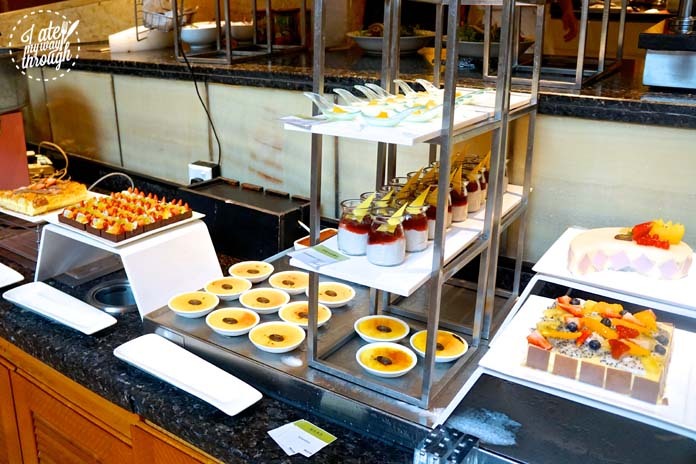 Famous as one of the best brunches in the city, the hotel caters to every audience with their complementary range of entertainment, and wide assortment appealing to all tastes. 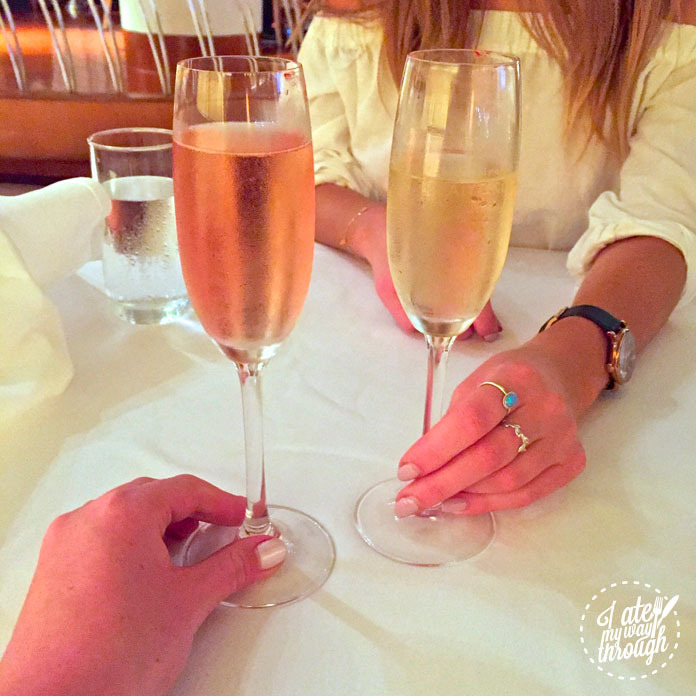 Greeted with a glass of Tattinger champagne, we were off to a great start! However nothing could prepare us for the ensuing sensory overload that was about to occur with the huge array of choice! 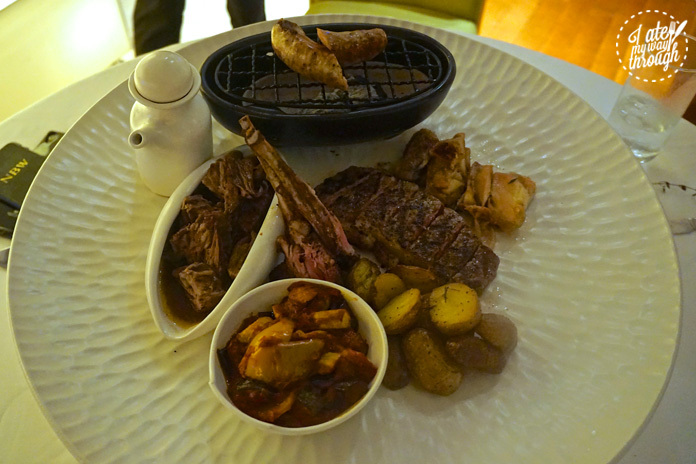 I was honestly so overwhelmed with the range of dishes, I had no idea where or what to begin with. Luckily, the hotel seems to have identified this and has consequently created a descriptive map and detailed floor plan of where to find what. 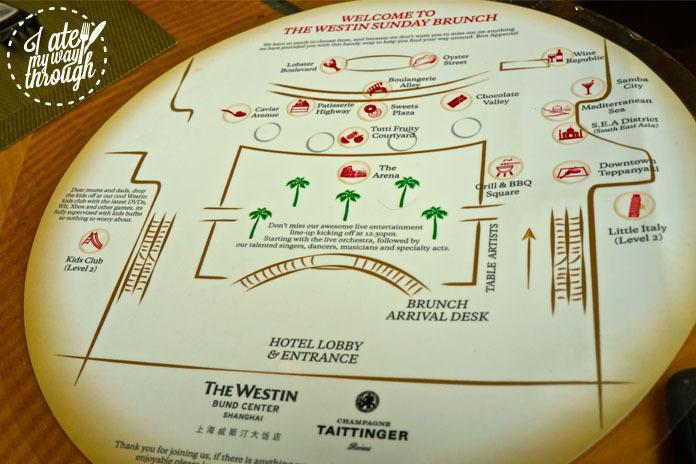 With humorous names such as the Mediterranean Sea, Grill & BBQ Square, Chocolate Valley, Tutti Frutti Courtyard and Lobster Boulevard, the map is a key tool that makes it a great deal easier to navigate the various items on offer. 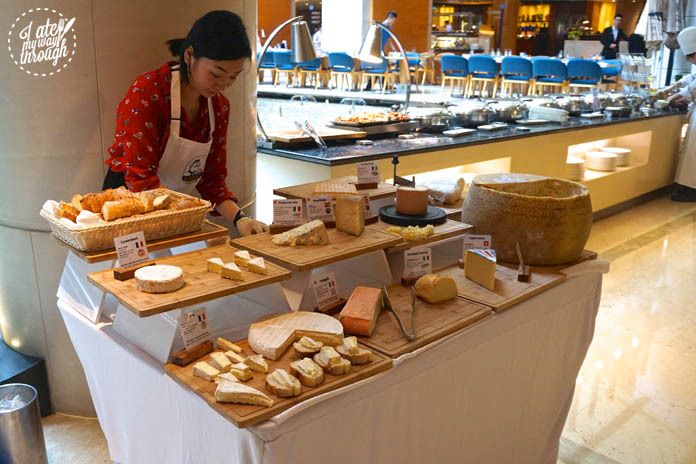 One of the first things to welcome guests is the cheese station with over ten different cheeses and its very own Parmesan bowl! 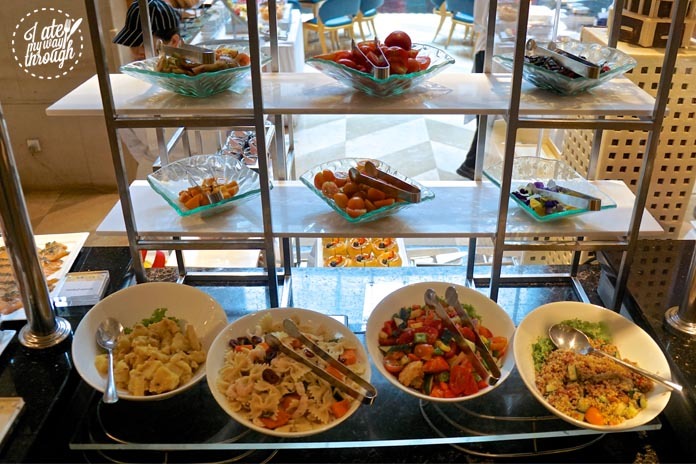 A fresh collection of antipasto inspired dishes looked tantalizing, the perfectly light way to start off the lunch with some cured salmon, nicoise salad, and char-grilled vegetables! One of my favourite features of the buffet was at the BBQ station, where chefs were cooking meat fresh to order outside on a BBQ and then serving it up with delicious condiments to accompany. 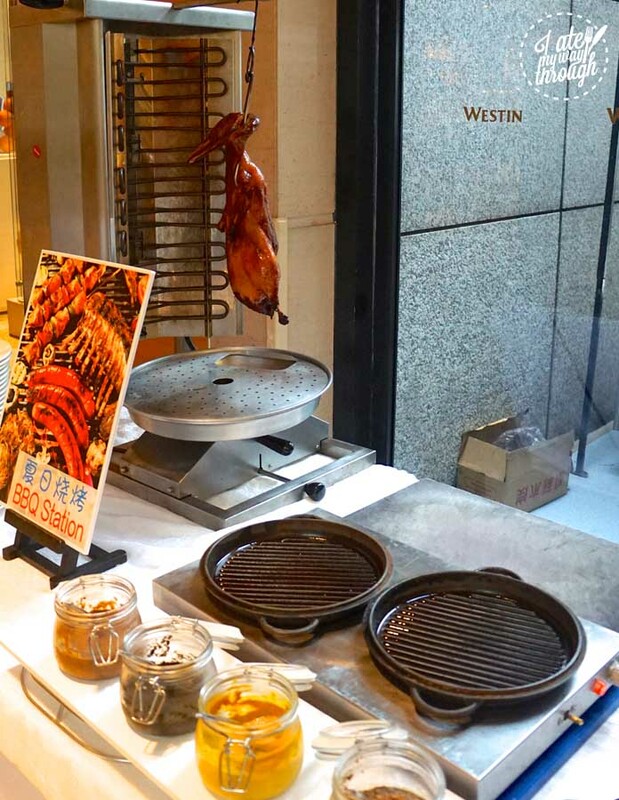 I particularly loved the BBQ duck, which was being carved up before our eyes and transformed into juicy peking duck pancakes (I may have had four too many of these babies!) 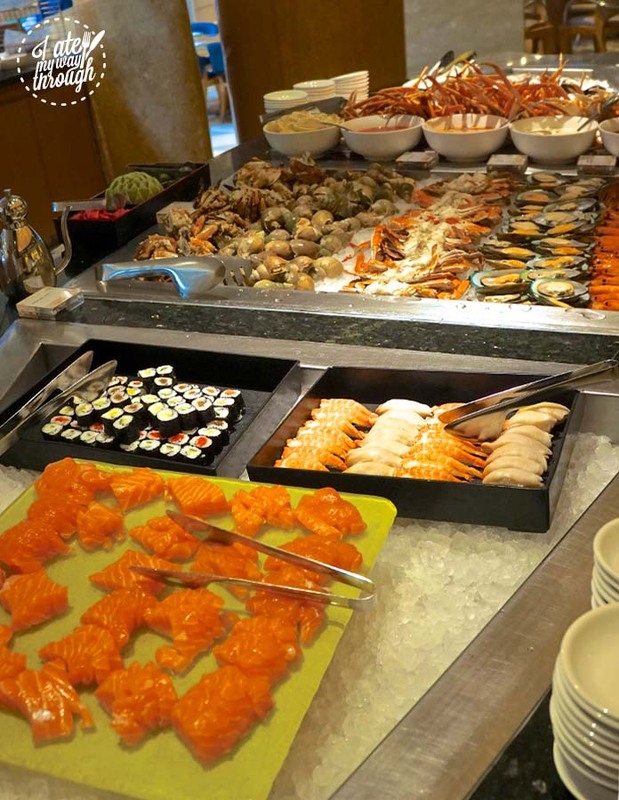 The seafood display was jaw dropping- with every crustacean you could possibly think of! 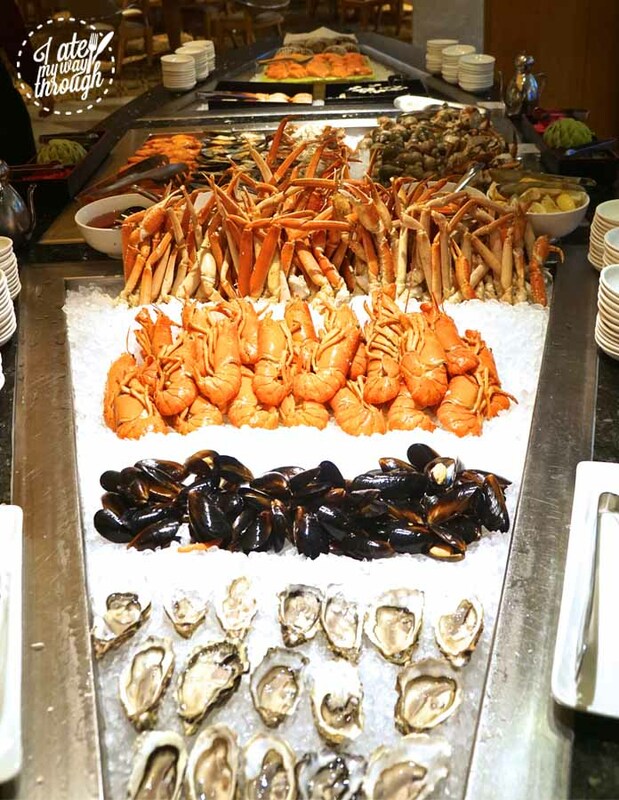 From prawns, oysters, fresh sashimi, crab claws, lobsters to mussels, sushi and yams- you’d be mistaken for thinking the sea might be empty now! 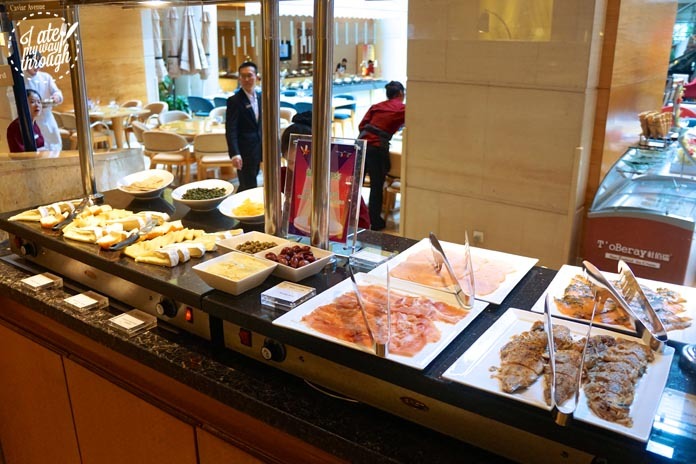 Other dishes included a Middle Eastern station with shish kebabs, lamb kofte, falafel and pita bread, a selection of Indian curries and naans, roast meat, casseroles, all of the traditional Chinese dishes, a pasta station, freshly cured seafood and deli meats. My plate looked like a messy blend of international flavours fused together! 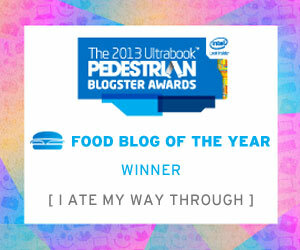 But it was still all so delicious! Children can be placed in the crèche on Level 2, which is full of goodies for them to feast on! Nannies take care of the little ones, and they can enjoy their own mini buffet of sandwiches, hot dogs and cupcakes. In economics, there is a behavioral finance disorder where one feels the need to try a little bit of everything when investing their stock portfolio. 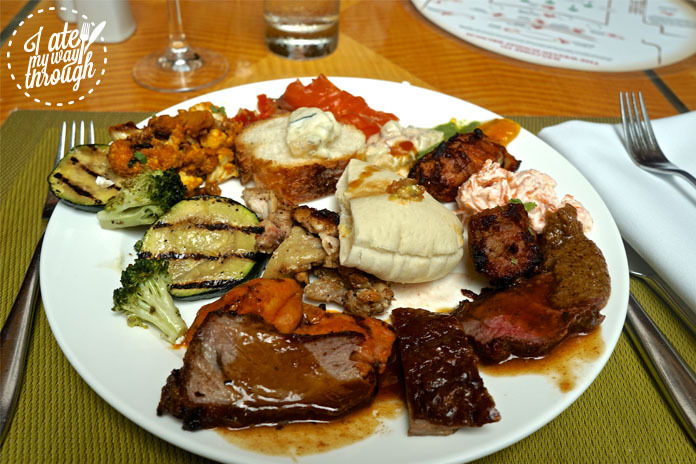 As you can see, my plate became victim to this, as a hot mess featuring a wild mix of dishes! A live orchestra plays to diners enjoying lunch and we were lucky to also enjoy a performance by three incredibly talented violinists. Opera singers and a live DJ are just some of the other entertainment that have you humming to the beat whilst enjoying the delicious food. For those interested in the boozy offerings- you are more than catered for here. With a Bacardi bar full of the best range of ingredients, let your mind run wild with some crazy cocktail concoctions. 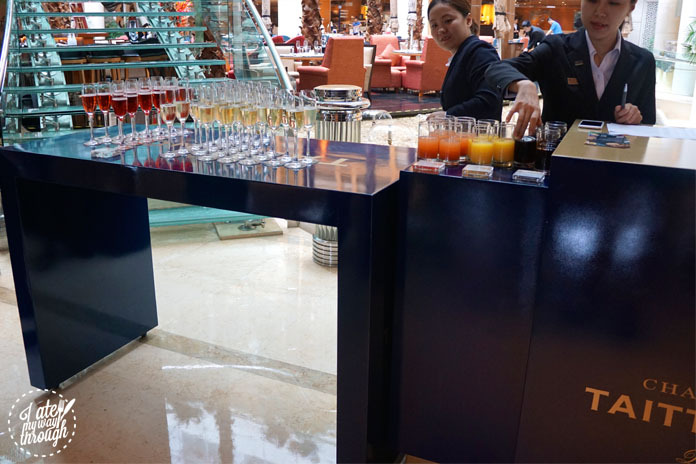 Beers, wine and champagne are a plenty, with waiters constantly ensuring your glass is replenished! 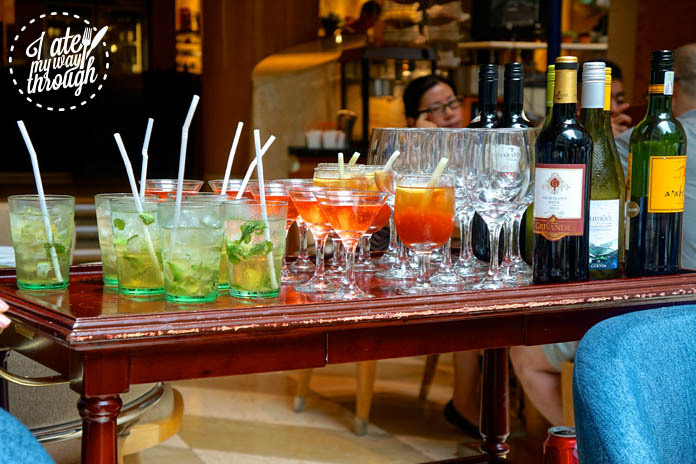 Furthermore, lovely servers wheel around vintage old wooden carts filled with some amazing mixtures including Mojitos, spritzes, fruity martinis and other potions. 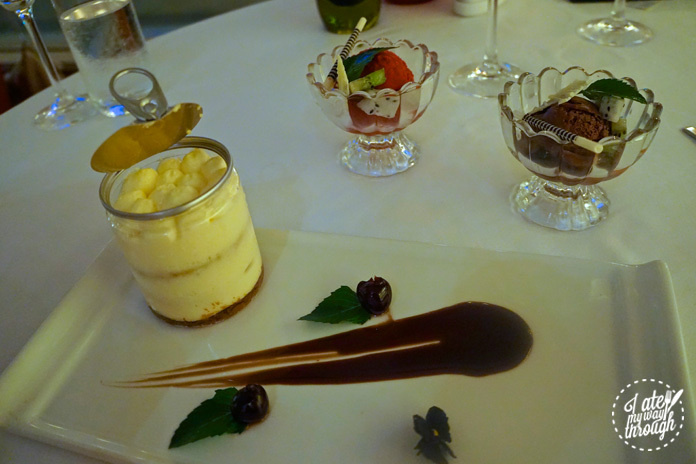 Thank God dessert is another stomach, because the assemblage of sweet treats was mouthwatering. 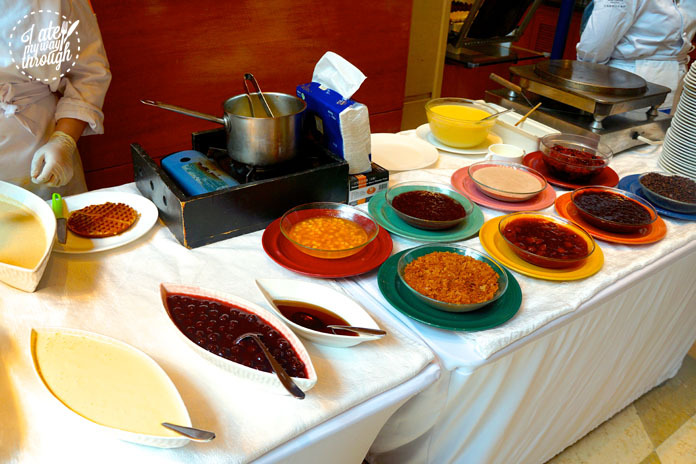 A waffle and crepe station allowed you to have these goodies made fresh to order, with whatever topping you wanted from fruity jams, choc chips, cream, vanilla anglaise to chocolate sauce, crumble, praline or berries! The self-serve ice-cream was the perfect accompaniment. Meanwhile the many different cakes, puddings and sweets had us in a sugar coma! 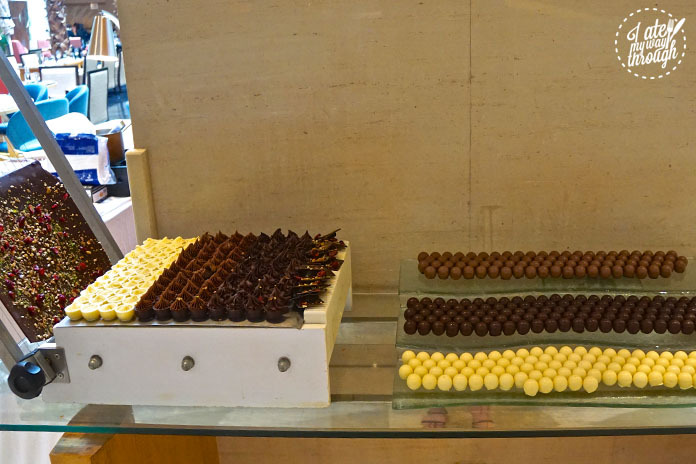 Handcrafted chocolate truffles were ever so moorish and delectably good. 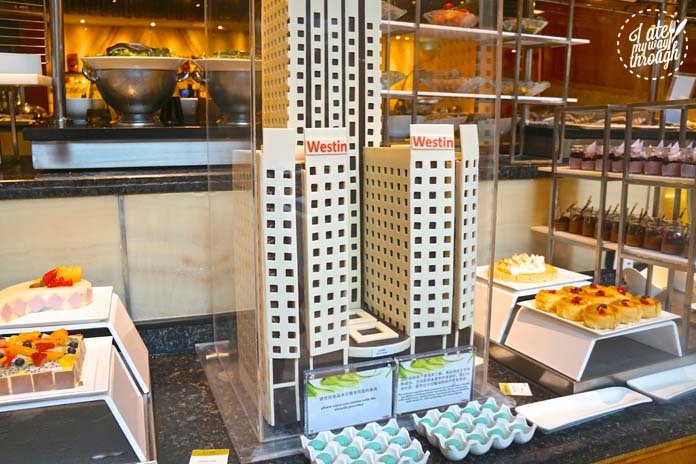 The centerpiece was a specially created chocolate structure of the hotel itself! 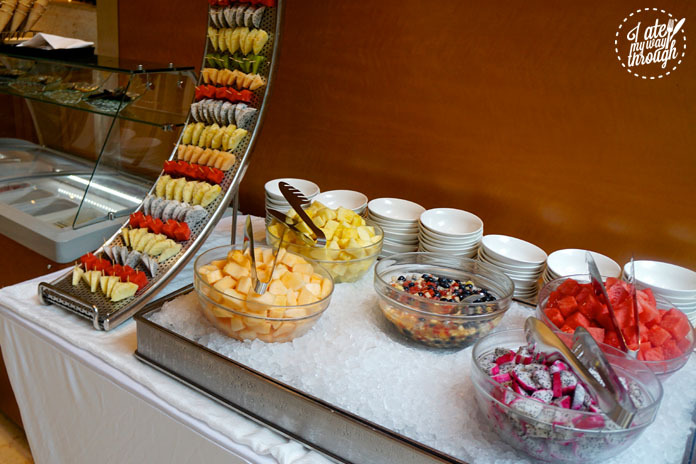 Oh, and for those looking to stick to the health conscious approach, a bright range of fresh fruit will sort you out! By the end, we heaved ourselves out of the buffet, in a self-induced food coma, absolutely stuffed to the brim and ready for a nap! Lucky we only had to catch the lift upstairs, before collapsing onto our fluffy bed in a heap.